Click the Menu Item Type Select button and then click the Submit a Web link link under Weblinks. Status. (Published/Unpublished/Archived/Trashed) The published status of the item. *Note: Trashed is not an available option because the Web Link does not exist yet. 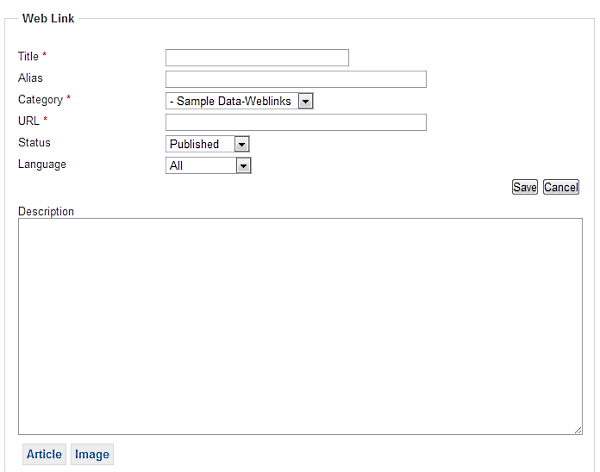 The only options are Published or Unpublished when submitting a new Web Link. For use of the Article, Image and Toggle editor buttons, see Editor Buttons.